Francis Bacon (October 28, 1909, Dublin, Ireland, to April 28, 1992, Madrid, Spain) was a British abstract expressionist artist. Critics consider him one of the bleakest and most depressing painters of the last century; at the same time, his paintings are some of the most expensive to be sold at modern auctions. In 2013, the triptych Three Studies of Lucien Freud was bought for a record $142.4 million. Bacon’s lack of artistic education allowed him to experiment widely in a variety of styles, which was subsequently reflected in his paintings. The central subject of most of Bacon’s works is the human body, represented in various, sometimes bizarre, poses: elongated, curved, or inside geometric backgrounds without any complementary composition. This is how people see artists, exhausted; lonely; and locked in a cage of flesh, rules, and restrictions. 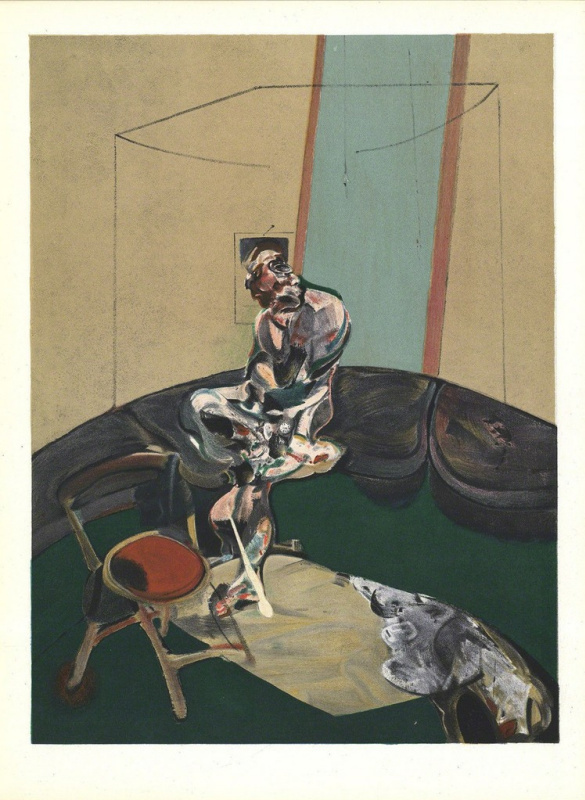 Francis Bacon preferred triptychs, as well as painting in series dedicated to a particular topic. 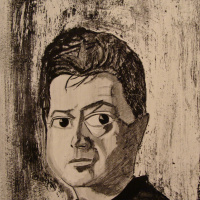 Francis Bacon was born in Dublin into an Irish family, before soon moving to London. Francis' father, Captain Anthony Edward Mortimer Bacon, was a race-horse trainer who joined the military in 1919; his mother, Christina Winifred Firth, was an educated woman. The Bacon family often moved, which, along with Francis’s asthma, hampered his formal education. At the age of 16, the young Bacon left his parents' home, deciding to start life on his own. For the next two years, Francis lived in London, earning money, before moving to Berlin, where relatives of the Bacon family lived. After some time, he moved to Paris and devoted himself to learning French while working as an interior designer. Francis Bacon decided to start painting after visiting an exhibition by Picasso in 1927. He was completely self-taught. By studying such great masters as Rembrandt, Velasquez, Titian, and Michelangelo, Francis delved into their technique of stroke, composition, and blending shades. The artist’s gift, once hidden inside him, was fueled by his work as an interior decorator. Beginning in 1931, Bacon was painting exclusively and living on money won at the roulette wheel. One of his first paintings was Crucifixion (1933, Murderme Collection, London), which caught the attention of the public. It was exhibited in the London Art Gallery and featured in the popular book Art Now. Very few paintings by Francis Bacon from the 1930s have survived: not having a professional education, he was not very happy with most of them, dismissing them as sketches. Bacon destroyed most of his early works, either completely or partially, cutting up the canvas pieces and using them as palettes. His first exhibition was held in 1949. By this time, he was already being billed as the leading English artist, the public being enthralled by the unusual figures he depicted in his melancholy paintings. Critics tried to describe what they saw in layman’s terms: despite the fact that the people in the paintings looked hopeless and frightening (stubby monsters, twisted, eyeless, spread out in space or enclosed in rigid shapes), the audience found information in them that resonated empirically with their thoughts, fears and feelings. 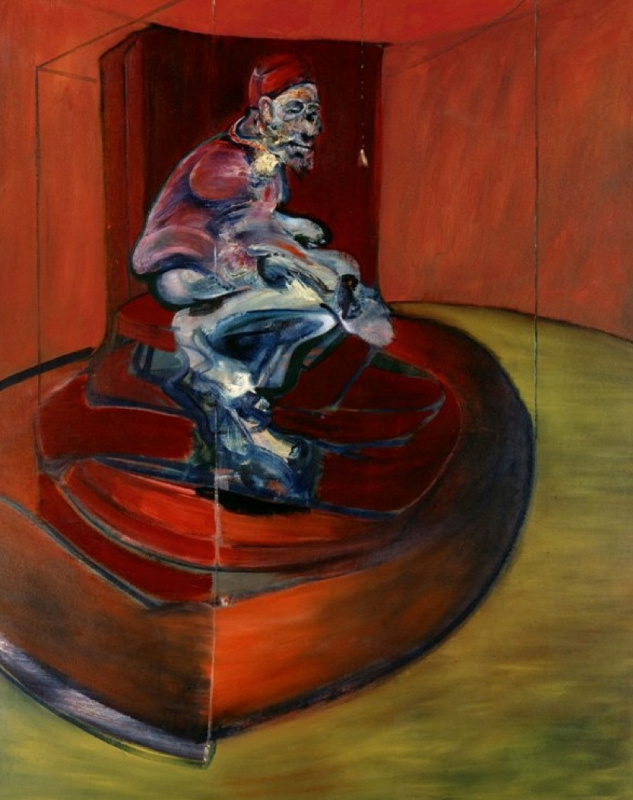 To describe the work of Francis Bacon in a figurative way, his works are a desperate plea in which the pain of existence can be heard. He sought to convey the whole gamut of feelings that human beings experience: panic, loneliness, misunderstanding, and rules that constrict freedom, including creative ones. Creating his images, the painter sought to convey not the external form of the body, but its innermost feelings, and that distortion made the object more real. Francis Bacon was constantly striving for excellence: he studied posthumous masks and funerary portraits; he constantly painted self-portraits, standing for hours in front of a mirror; and he experimented with color, copying the canvases of Van Gogh. In the 1950s he began series of paintings united by a common theme. During this period, he also tried a new technique: after being mixed with dust and dirt, the paints were applied to unprepared canvases with a steel fiber brush. 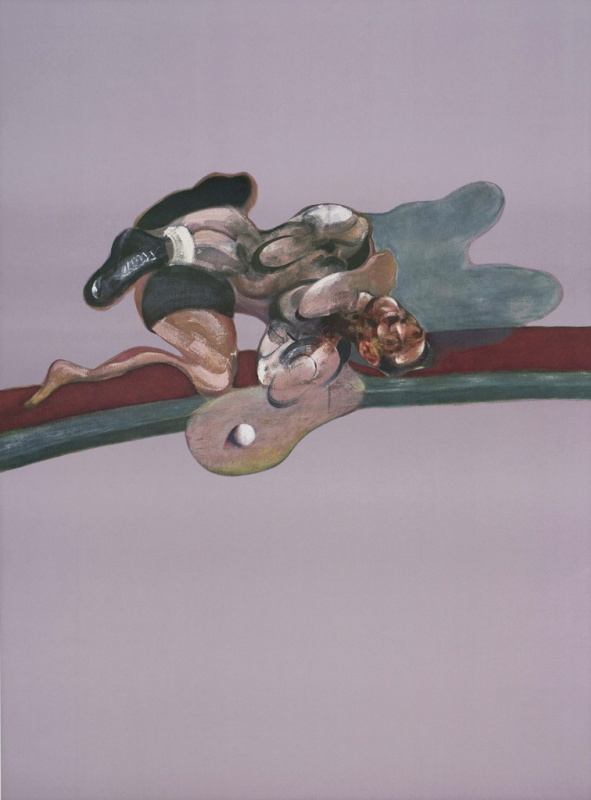 In the 1960s-1970s, the art style of Bacon’s works gradually lost their aggressive intensity, but the theme of solitude and isolation remained. After doing his paintings in series, he switched to triptychs, which for a long time became his favorite artistic form. Bacon created several triptychs on the theme of the crucifix, which simultaneously shocked the public and fanned its interest in him. By the end of the 1970s, Bacon departed from his "distorted reality" style and began using oblique shading, depicting faces as recognizable as possible. Today the artworks of his troubled genius hang in private collections and art galleries. From time to time, Bacon’s paintings appear at auctions, where they are purchased for large sums of money by true connoisseurs of his work. Study after Velázquez's Portrait of Pope Innocent X (1952, Des Moines Art Center) perfectly captures Bacon’s fascination with screaming faces and twists a classic piece of art into a modern horror masterpiece, portraying the highest representative of God on Earth (according to the Catholic Church) in incredible pain or rage, gripping his golden throne tightly in what looks like a torturous hell. 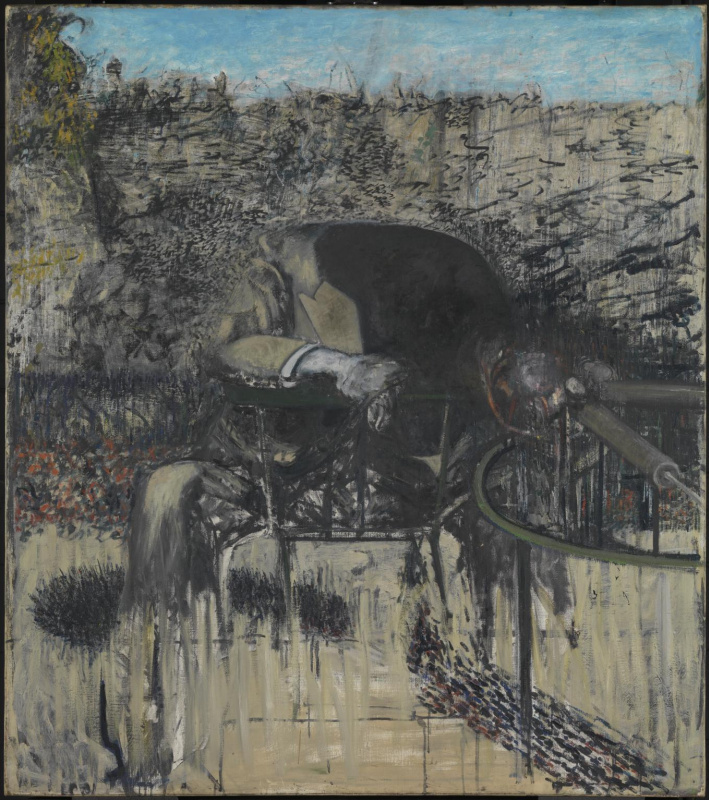 Three Studies for Figures at the Base of a Crucifixion (1944, Tate Britain, London) is a triptych influenced by the Greek Furies, and Francis Bacon himself considered it to be his first important artwork. The demonic-looking creatures, the third whose head is simply a screaming mouth with ears with the body of a starving dog, are his interpretation of the legendary spirits that sought revenge for mothers and fathers killed by their children. Bacon painted eight works in his series Study for a Portrait of van Gogh in the 1950s, an analysis of the Dutch master in all of his lonely, isolated sadness: a true suffering artist. It was based on The Painter on the Road to Tarascon, which had been destroyed during the Second World War, forcing Bacon to rely on reproductions. 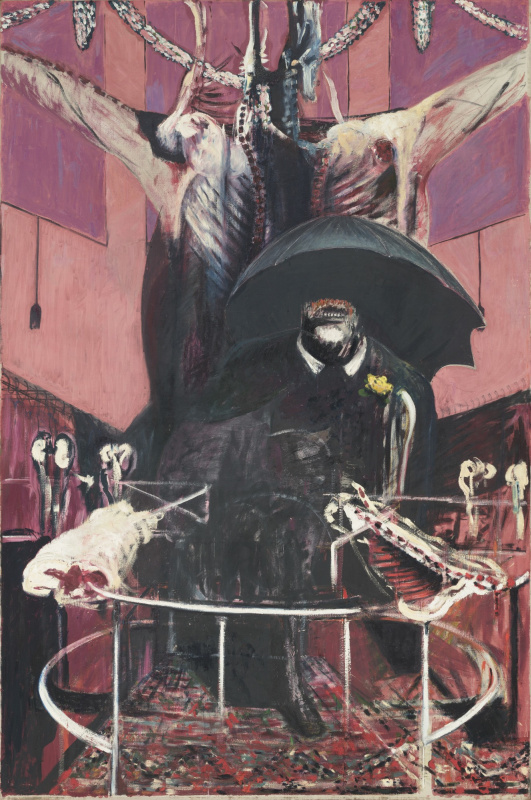 Painted in the painful aftermath of his lover George Dyer, The Black Triptychs (1972, 1973, Tate Gallery), is a series of three triptychs celebrating the life of the young, depressed man in a way that only Bacon could. Although he denied any symbolic meaning behind his art style and never considered himself an expressionist, it was widely accepted that by painting, Bacon expressed his emotions that he was so hesitant to talk about. Three Studies of Lucien Freud (1969, Private Collection) shows Freud, Bacon’s friend and fellow artist, on a wooden chair; like many of his subjects, Bacon put him partially in a transparent cage, sort of a frame within the picture, and distorted his face and bodily proportions, which gives the figure a relaxed feeling and illusion of movement. Francis Bacon died of a heart attack while on vacation in Madrid on April 28, 1992, after suffering from chronic asthma his whole life, which had steadily worsened.